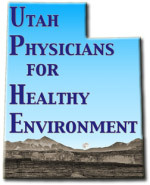 Utah Physicians for a Healthy Environment is a small group of health professionals with concerns about the health risks currently present in our environment. Their concerns are based on recent articles and the amount of overwhelming, convincing evidence in the medical literature demonstrating that more people have coronary and cerebrovascular events (heart attacks and strokes) when air particulates (one form of air pollution) are high. Utah Physicians for a Healthy Environment is dedicated to protecting the health and well-being of the citizens of Utah by promoting science-based education and interventions that result in progressive, measurable improvements to the environment.